Thanks to your support, we can climb to the top of the Higginson Tower again! There is still time to join our community partners. Below, we tell you how your contribution can become a lasting and visible tribute on the Higginson Tower site. We invite you to join us. Here’s how you can get involved. Become a Friend of the Tower! It’s easy! Donate any amount to the Higginson Tower Restoration project. ALL THOSE WHO MAKE DONATIONS will receive charitable donation receipts issued by Champlain Township. Need more information? 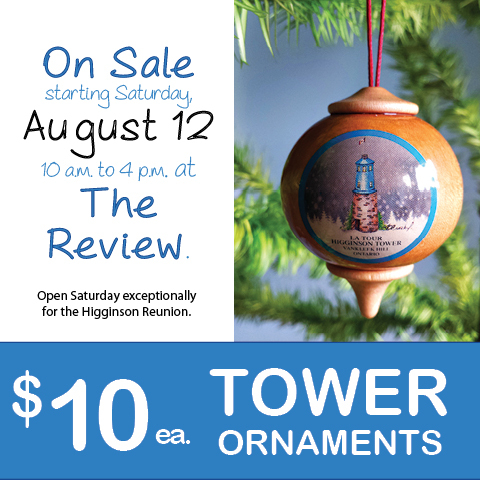 Want to share a memory or story about the Higginson Tower? Want to share a picture?